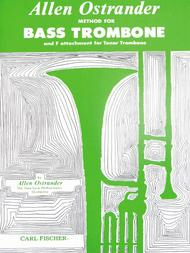 Method for Bass Trombone (And F Attachment for Tenor Trombone). Composed by Allen Ostrander. For Bass Trombone, Tenor Trombone. Classical. Student book. Standard notation. 48 pages. Published by Carl Fischer (CF.O4517).ISBN 0825835348. With Standard notation. classical.